Iconic cover created as 5' x 5' painting in acrylic on canvas. 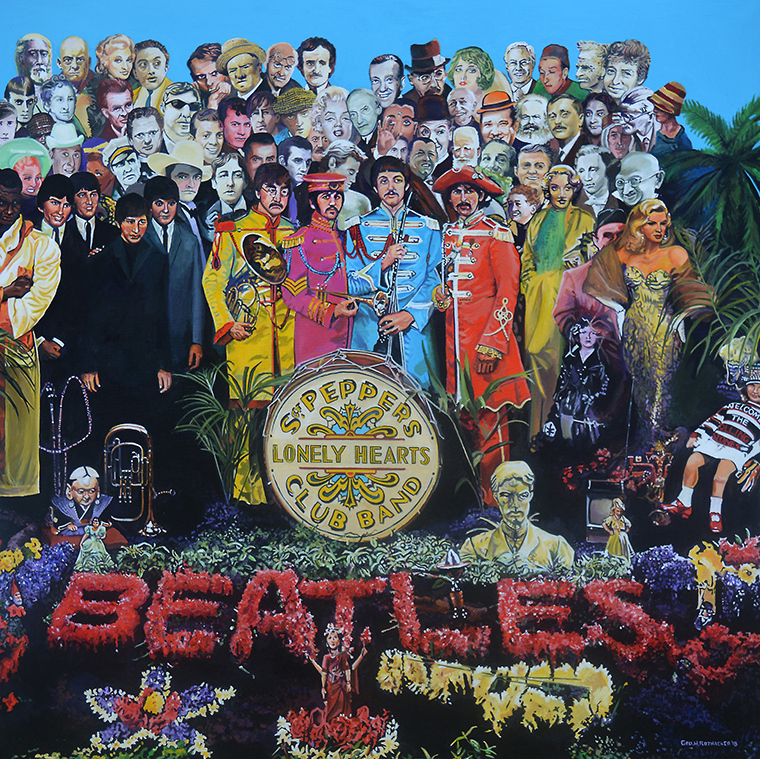 This work which features all of the original characters (and more) from the 1968 Grammy Winning cover produced for the “Sgt. 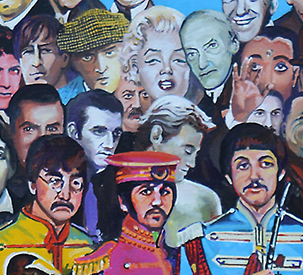 Peppers Lonely Hearts Club Band” album was created as a commission and is now available for sale by the owner. The original cover art was stage using a variety of images (many of them as Xerox copies) from photos or artwork available at the time. Reproduction was not especially good, and certain images were deleted in the final reproduction due to copyright infringements or directorial edits. Basing his painting on the original intentions of the designers, George Rothacker researched the 60+ images used and, in many cases, adapted original art to meet the look and feel of the original cover art. “My intention was not to merely ‘copy’ the cover (which would be impossible because of the degraded images), but to assure that the images were of a quality consistent for a piece of art created 5 times the original size of the album cover (original size 12" x 12”). Due to space restrictions, the owner is forced to make the painting available directly for purchase. Prospective buyers should call the artist at 1-610-566-0334, or email Mr. Rothacker at george@rothackeradv.com for further info including cost and shipping. ...specially sized for that perfect wall in your den, office, bedroom or living room. Take your imagination a step further and have an image custom made for you of your favorite star for a family member, friend or client brilliantly produced in metal or acrylic at any size up to 48" x 96." But then look outside the box and have the image painted on canvas by the nationally renowned artist George H. Rothacker, just for you! or custom painted by Mr. Rothacker on canvas. Take a look at some of the images in this site and see if you find your favorite artist. Maybe you have one in mind that you don’t see, but would like created in a similar style. Look around this site and survey Mr. Rothacker’s impressive portfolio of cars, trucks, movie theatres, Havana, the Movie and Music of Hollywood and 20th Century American Writers. or complete the info on the form, and Mr, Rothacker will get back to you with regard to your custom request. *Standard sizes available are shown on each artists' page along with the total number of prints available and the number still available at time of purchase. 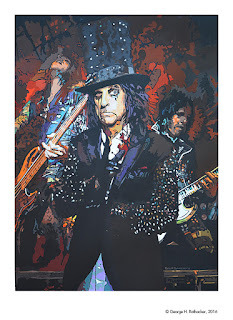 canvas painting of Alice Cooper. 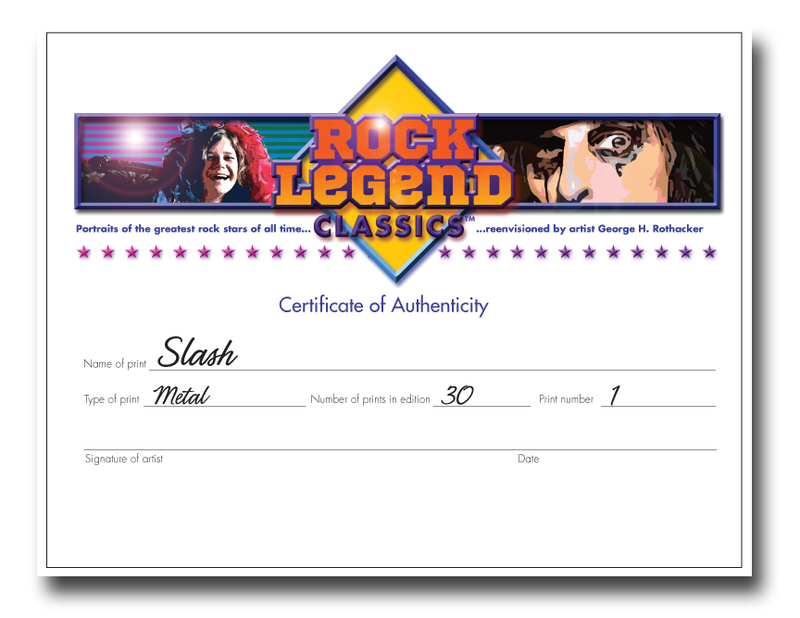 Use the menu at the right and below to view available images of rock legends created at this time. The series will expand over time, or you may select your own legend for print or canvas. Click here to request and provide information on prices for custom sizes, specific artists or groups, or original paintings of “legends” by George H. Rothacker. 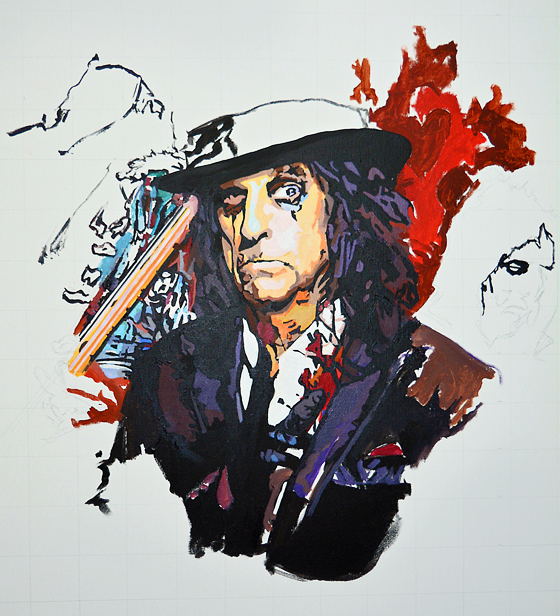 George Rothacker has created a 40" x 30" painting of from his original Alice Cooper design. He is offering a limited edition archival, signed and numbered print (100 in the edition) with 30% of the proceeds benefiting the Media Fellowship House Camp Media Theatre Scholarship Program. Money collected from the sales we be donated directly for scholarships for a deserving child enrolling in the Camp Media Theatre 2017. 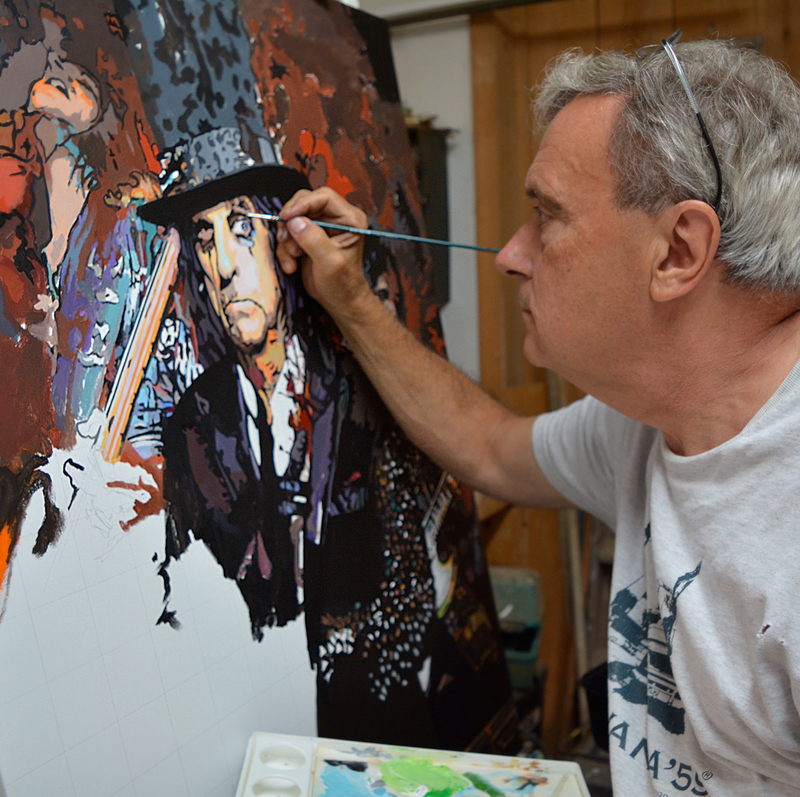 In addition, 30% of the sale of the painting will also benefit the program. Offer is valid until December 31, 2016. (Click here for info on the Media Theatre’s Summer Camp). 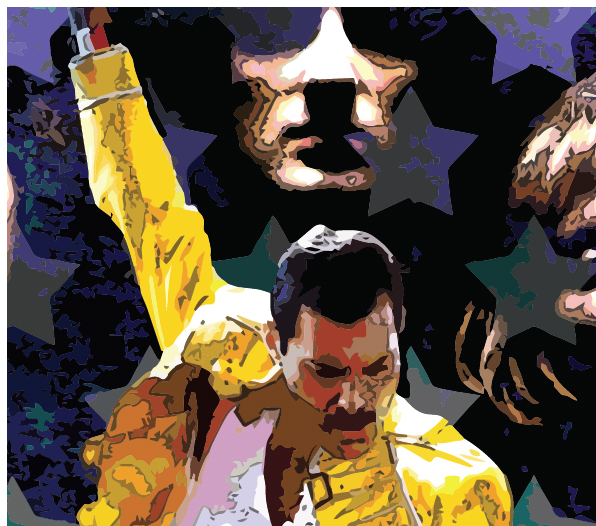 Sales of signed and numbered Media Theatre Prints are also available through George's website and benefit the Scholarship Program). (Click here to view Media Theatre page on George’s website). Exclusive rights are available for any print not previously printed. Click here for form for custom requests.